Après avoir doublé la pointe de Samos dans un crépuscule aux lumières prémonitoires de leur nuit, les solitaires ont entamé leur bataille de l'ombre. Solent, grand-voile arisée pour la plupart, les navigateurs ont dû batailler toute la nuit et travailler leur science de la conduite. Dans ces conditions difficiles un trio de choc pointe aux avant-postes : Francisco Lobato (Roff Tempo Team), accompagné de Gildas Morvan (Cercle Vert) et de Jeanne Grégoire (Banque Populaire) a creusé un petit trou sur le reste de la flotte. C'est le genre de nuit impitoyable qui lamine les corps et demande toute l'expérience que l'on a pû engranger mille après mille. Dans ces conditions rudes, les quelques épatants outsiders qui avaient animé ce début d'étape comme Arnaud Godart-Philippe (Senoble), Mika Mergui (TPM Hyères) ou bien encore Anthony Marchand (Espoir Région Bretagne) ont dû rentrer progressivement dans le rang. Leur mérite n'en est pas moins grand, mais l'expérience a un prix à payer. Ian Williams. Image copyright Charles Anderson/RBYC. A complex tiebreaker count-back knocked Great Britain’s Ian Williams out of the medal rounds in the Argo Group Gold Cup. He lost a three-way tiebreaker and failed to make the cut to move up to the Quarter-Finals from the ‘last chance’ repechage round-robin Friday morning. 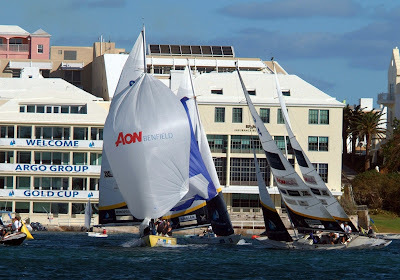 The Group 4 six-team sail-off ended in a three-way tie between Williams, Kiwi Adam Minoprio’s BlackMatch Team and Great Britain’s three time Olympic gold medalist Ian Ainslie’s Team Origin. Ainslie beat Minoprio, Williams beat Ainslie, and Minoprio beat Williams. Each team had 4 wins and 1 loss. Williams follows Minoprio. Image copyright Charles Anderson/RBYC. Originally the event organizers and the umpires decided to stage a sail-off with the three teams. Each skipper drew a letter. Minoprio drew ‘A’, Ainslie drew ‘B’ and Williams was left with ‘C’. 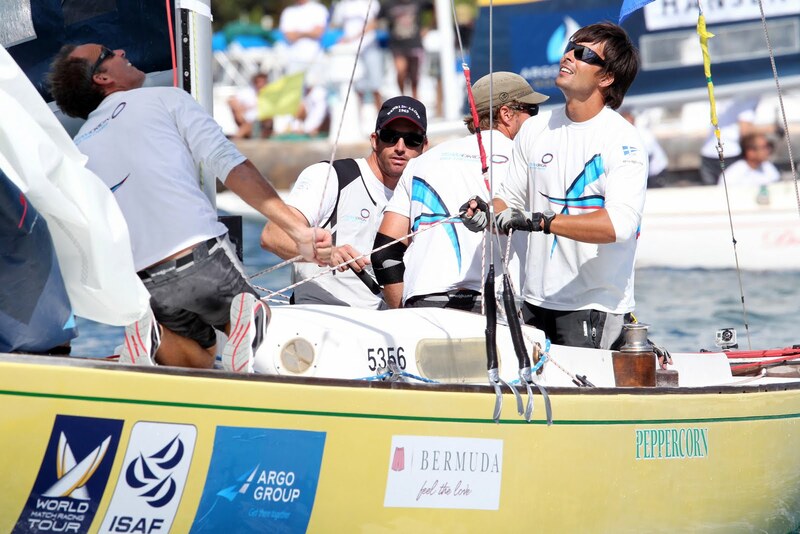 Under the scheme, Minoprio would sail Ainslie and the winner would qualify for the Quarter-Finals. The loser would then sail Williams and the winner of that match would advance while the loser would fall into the 5-8 bracket. But Williams objected and filed a request for redress. 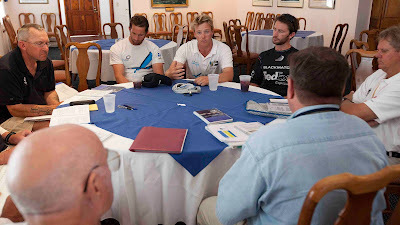 Under the Racing Rules of Sailing (RRS) Chief Umpire Shane Borrell convened the international jury to here the request. 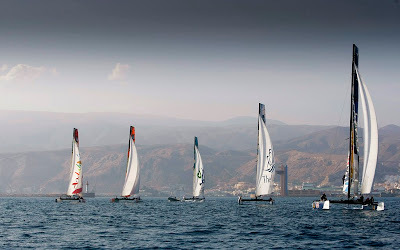 They concluded that there was a three-way tie in the repechage group and that the repechage round was in fact part of Stage 1 of the event, sailed as Group 4. Williams vs. Minoprio. 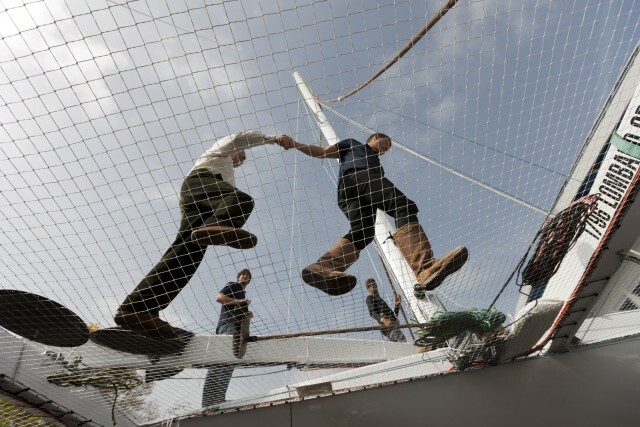 Image copyright Charles Anderson/RBYC. Under the RRS tiebreaker rule C11.1a as applied to the three competitors, Ainslie came out on top with two wins. He automatically moved up to the Quarter-Finals. Minoprio and Williams were still tied. 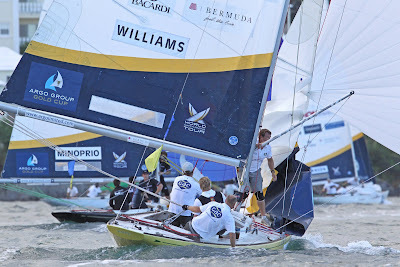 The same tiebreaker rule was then applied again; and since Minoprio beat Williams in the only match they had sailed against each other so far, Minoprio took second place in the repechage. Minoprio moved up to the quarters and Williams lost their last chance. Weather mark. Image copyright Charles Anderson/RBYC. 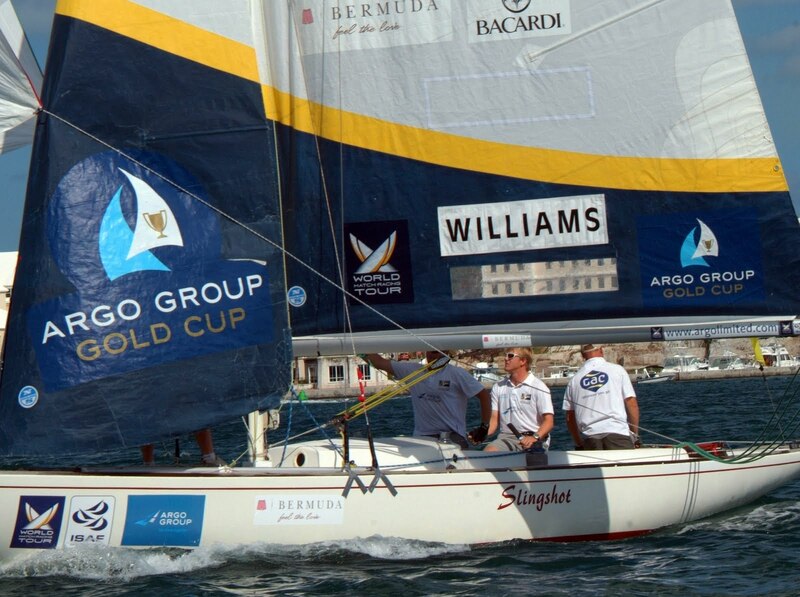 The set back for Williams and his Team GAC Pindar sponsored by Argo Group was enormous. He was ranked #4 on the Tour going into the Argo Group Gold Cup and hoped to pick up valuable Tour points in Bermuda. Ben Ainslie moves up to quarterfinals. Image copyright Charles Anderson/RBYC. Prize purse for the Argo Group Gold Cup is $100,000 and the winner takes home $50,000 of that. Second place takes $20,000, third takes $10,000 and fourth $7500. Fifth through eighth split the rest. Competition continues Saturday morning with the Quarter-Finals at 8:00. Shutting Ian Williams out at the committee boat. Image copyright Subzero Images/WMRT. In an action packed repechage series that saw Ben Ainslie, Ian Williams and Ourselves finish on an unbreakable tie, a tie break was used to decide who would be the two teams to progress. In a day packed with extreme controversy, an ‘on the water sail off’ was originally offered to both Ian Williams and Ben Ainslie to break the deadlock, however both British Teams were against this, with Ian Williams believing the sail-off was unfair, so they lodged a protest against the race committee. After turning down the opportunity for the sail off and deciding to take it to the protest room, the Brit put his case forward and in a massive turnaround it was decided that there was an oversight in the original decision to have a ‘sail off’ in the first place and it was to be us and Ben that would move forward. To The Room... Image copyright Subzero Images/WMRT. The decision was based on the fact Ben had beaten us in both his round robin match and repechage match, while Williams had only beaten him once in the repechage, so Ben was the clear winner. While we had only raced Ian once and beaten him in the repechage, so we were to go through in second position. Originally it was thought that another tiebreak system may be used which would see us miss out, but no-one including Ian William’s, thought that protesting the ‘sail off’ decision would see the former World Champion miss out. It was an incredible scenario with tensions running high and although we are ecstatic to have made it through to the quarterfinals, we were not entirely happy with the circumstances surrounding it. The debate begins. Image copyright Subzero Images/WMRT. Despite all the controversies off the water there was some awesome action on the water. Our start against Ian Williams was an absolute blinder, as we managed to shut him out at the boat end of the start line and force a double penalty on him when he tried to barge his way between us and the committee boat. Our advantage off the start line giving us an unassailable lead. Our race against Ben Ainslie saw us again nail the start but an uncharacteristic mistake up the first beat when we went to the wrong top mark cost us this race, an amateur mistake at this level which we will not be making again this week. The look on Ian Williams' face says it all. Image copyright Subzero Images/WMRT. In a twist of fate, tomorrow sees us up against Ben Ainslie in our quarterfinal match up. With the Top qualifiers reluctant to pick either Ben or Ourselves we were the only two teams left and it will be a replay of last years final. We of course are hoping for a better showing then last year and will be hoping to emulate our semi final victory against Ben the previous year, when we defeated him 3-2. We would again like to say a special thank you to our sponsors FedEx Express and Events Clothing/Line 7. Owen Rutter from Events Clothing has supplied us with new sailing gear this season, keeping the boys looking very sharp. The ongoing support of our sponsors is helping make this opportunity possible for the BlackMatch boys and we would also like to thank Emirates Team New Zealand and Steinlager Pure. BlackMatch is Adam Minoprio, Tom Powrie, Nick Blackman and David Swete. No racing today for Black Sheep but the two remaining quarter finalists are decided. After a very tight repechage series which ended up being decided by a complicated count-back system Ben Ainslie and fellow Kiwi Adam Minoprio progressed. Interestingly enough, this means four teams from our initial pool have qualified for the quarter finals. We were first pick for Jesper Radich who topped group 1 so we have the task of taking down a previous Gold Cup winner. Racing has been bought forward to an 8am start tomorrow and the aim is to get quarter finals, minor sail offs and semi finals completed so it will be a long day on the water. We would like to thank the Royal New Zealand Yacht Squadron, friends and family for their support. Thank you! Black Sheep Racing is Brad Farrand, Tom Bentham, Reuben Corbett and Nicolas Derberque. Mirsky leads Williams off the line. Image copyright Subzero Images/WMRT. An unbreakable tie brought Bermuda to bedlam today as Ian Williams was forced to pack his bags early as Adam Minoprio and Ben Ainslie came out on top after a series of complicated events took place in the jury room. The day dragged on when the repechage was completed and the sailors took to the shores - so much so that no racing took place in the afternoon. However the quarterfinals will proceed tomorrow morning. Phil Robertson on a scooter in Bermuda. Image copyright Subzero Images/WMRT. Today was an early start for all the skippers in the repechage, with a 7am briefing and 8am first race due too a bad forecast. It was an important four races for us with the top 2 finishers going through to the quarter finals. Condtions were from the opposite direction from previous days, blowing straight through the buildings off the city. The day started well with two solid victories over Bjorn Hansen and Alvaro Marinho. Next we had a very tight race with Ian Williams with penalties galore going both ways. Unfortunately for us when picking a couple of nice shifts and closing in on Ian he tried to lock us at the top mark. Whilst trying to get out of this position we just clipped the back of Ian. The umpires correctly ruled that we were in the wrong and handed us a penalty and Ian the race. The last race of the day was one that is always much anticipated for us. We got to have a shot at current world champions and great mates of ours BlackMatch Racing. Unfortunately today was not our day as the BlackMatch boys showed their class putting a penalty on us in the prestart and coming of the line to windward of us. We almost spat them after the start but luckily for them they got an inside right pressure (wind) at the perfect time, which enabled them to live and hold us for most the beat. After that they sailed really well not giving us a chance to catch up and went onto win comfortably. Overall this put us on 2 wins/3 losses and placed us 10th for the regatta. This is a pretty disappointing result for the team as the two things (time on distance and starts) we identified prior to event as being crucial for this event, we performed poorly at. Luckily we get a chance for redemption soon enough in the very familiar Foundations 36 in Malaysia at the Monsoon Cup Qualifier. So for now its back home for the boys for a week or so, with some training on the agenda. 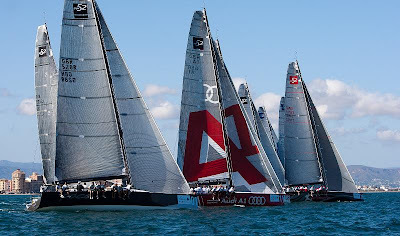 Waka Racing would like to thank our main sponsor Tax Management NZ and all the support we receive from the RNZYS, Frontend, Zhik , Wells and Co, PredictWind and Devine Consultants. Waka Racing is Phil Robertson, Garth Ellingham, James Williamson and Sam Bell. The skippers present their case to the international jury. Image copyright Subzero Images/WMRT. 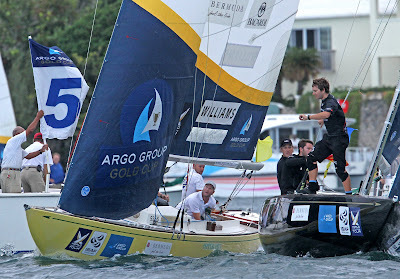 Ian Williams (GBR) Team GAC Pindar sponsored by Argo Group crashed out of Stage 8 of the ISAF World Match Racing Tour in dramatic fashion following a three way tie-break between his team, Adam Minoprio (NZL) ETNZ/BlackMatch Racing and Ben Ainslie (GBR) TEAMORIGIN. After a tense period of deliberation locked away in the race office, the committee called for a sail-off but the skippers were unimpressed. In an atmosphere of tension, confusion and frustration, Ainslie’s tactician Iain Percy remonstrated that his team’s earlier defeat of Minoprio appeared to count for nothing. Ian Williams also called to question the very format of the proposed sail-off. It fell to the international jury to attempt to diffuse the mounting controversy.After a long deliberation, Chief Umpire Shane Borrell explained that the countback should be based on all the earlier matches, not just those in the Play-Off. The sail-off was therefore unnecessary and Ainslie and Minoprio would go forward to join the other six teams in tomorrow’s Quarter-Final knock-out matches. The decision, however, left Williams enraged and he stormed off with his quest to become ISAF Match Racing World Champion for a third time in tatters. On the water it had been an action-packed day with strong and gusty winds, saw numerous quick-fire penalties, breakdowns and collisions that brought spectators off their seats. 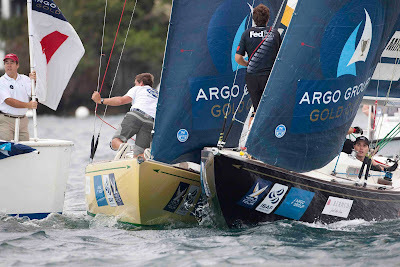 The tone was set from the start with Williams pinned between the start boat and Minoprio’s vessel, eventually colliding with both and earning Williams a double penalty. That’s a costly manoeuvre in the long-keel International One Designs raced here and the British skipper never recovered. With next to no room for error in the Qualifying Play-Offs, every skipper had to be on their game. Like Minoprio, Ainslie displayed a ruthless yet tactical edge in each of his matches. Having clawed back a three-length deficit against Alvaro Marinho (POR) SETH Sailing Team, Ainslie jostled with the Portuguese skipper, exchanging a string of penalties before the Brit landed the final knock-out blow just before the finish line. Ian Williams prepares his case for the jury. Image copyright Subzero Images/WMRT. With the pressure increasing on Minoprio, Ainslie and Williams, the latter’s match against Robertson became even more crucial. The intensity matched the importance with penalties picked up in the pre-start and on the final beat. Although Robertson finally powered ahead to take the lead seconds before the finish, he didn’t have time to spin his penalty off before Williams took the winner’s flag. Ainslie vs Minoprio was a monster match that Ainslie needed to win to retain a chance of staying in the competition, while victory for Minoprio would secure him one of the two remaining Quarter-Final places. Minoprio started tight under Ainslie’s leebow, forcing the Brit to tack away to the right of the course. This put them on the best side of the big windshifts to take a four-length lead at the first mark. Minoprio challenged hard to close this to just one length at the finish however he wasn’t able to find an opportunity to get ahead. Tomorrow sees the racing re-convene and with Minoprio and Ainslie both still in contention, the race to challenge Mathieu Richard (FRA) French Match Racing Team overall lead in the World Match Racing Tour is firmly on. Emirates Team New Zealand Extreme 40 out of the water in Almeria. Image copyright OC Events. Emirates Team New Zealand skipper Dean Barker, bowman Jeremy Lomas and grinder Winston Macfarlane have had a good introduction to top-level catamaran racing in the Extreme 40 series at Almeria, Spain. Friday was practice day with a light 5-8 knot breeze. 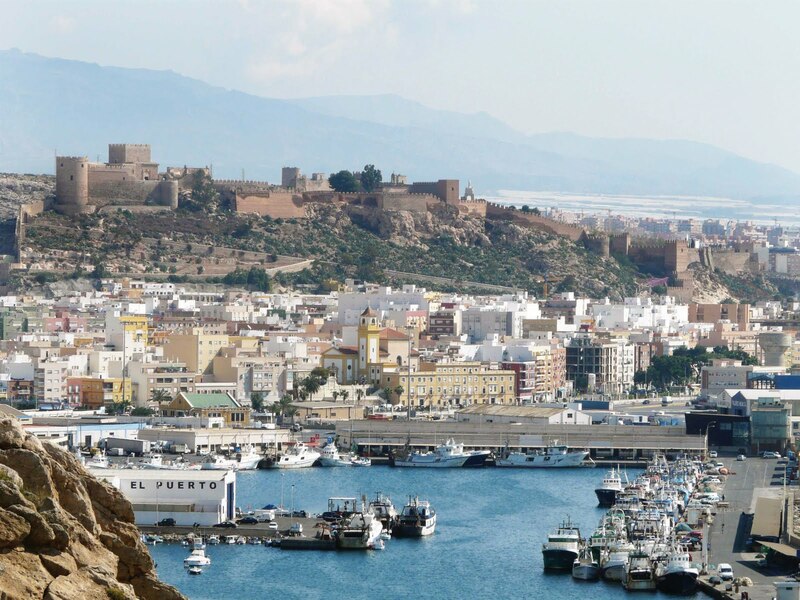 Almeria, southern Spain. Image copyright Andalucia Junta. With Australian multihull specialist Darren Bundock on board to help the transition from monohull tactics and boat handling to fleet racing catamarans in confined waters, Barker said: “It was a day of lessons and we learned a lot. “We made a lot of fundamental errors – and that’s hardly surprising. We were up against a lot of very experienced cat racers who were sailing aggressively while we were erring on the side of caution. “We have to find the balance between controlled aggression and stupidity in the multihull environment .... learning what we can get away with in terms of boat positioning and control. Tomorrow’s racing will start at 2pm, with two or three races outside the harbour’s confines. 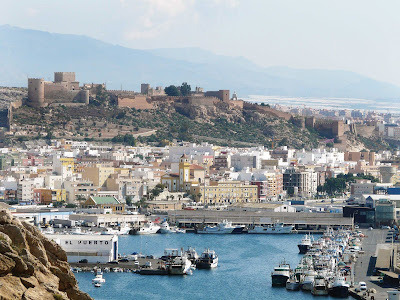 From 3.30pm racing will be inside the seawalls of Almeria’s harbour. The breeze will be light earlier in the day and is forecast to get up to 15 knots in the afternoon. The Extreme 40s racing off Almeria. Image copyright Paul Wyeth/OC Events. 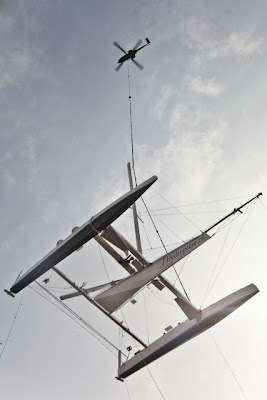 "...we had 4 races, 2 with upwind starts and 2 with downwind. 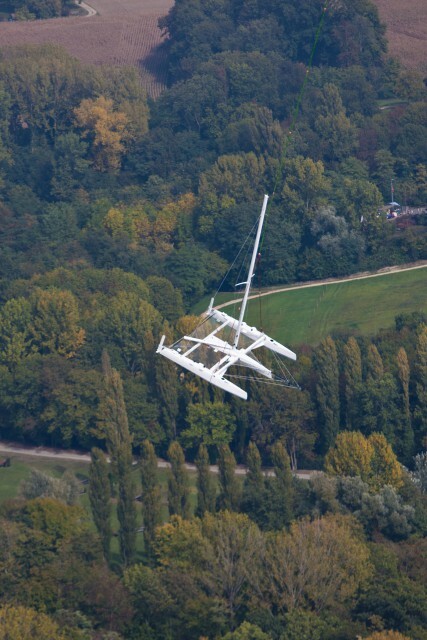 If learning just to start a multi is enough of a challenge, starting downwind adds a whole new element. "We had placings of 7,5,3,8 which was ok but in every race there were a number of mistakes which cost us time or position. As you would expect we have a lot to learn... but it is all part of the change of class." Rumbo Almeria. Image copyright Paul Wyeth/OC Events. Eight teams are now taking centre stage here in Almería for the four-day final round of the Extreme Sailing Series™ 2010 season that starts tomorrow [Saturday, 9th October]. Whilst racing is at the forefront of their mind, the skippers have also all personally elected a charity that can share in the reward of coming first. This season’s winning boat will receive €5000 to be donated to their cause, which adds some meaning to the circuit as current leaders The Wave, Muscat’s Khamis Al Anbouri stresses: “The charity we support is called Dar Al Atta’a and does an amazing job helping poor people in Oman. They built houses for people who have been hit by cyclones and will deliver some more soon. We will be fighting hard to win and donate the prize to Dar Al Atta’a, it would be great to do something for our country.” Whether they’re humanitarian or environmental, the causes supported by Extreme 40 teams are diverse but all showcase the sailors’ involvement as well as their ability to see ‘beyond the sporting arena’. Skippers' press conference - at least Franck Cammas and Loick Peyron are smiling at the camera! Image copyright Paul Wyeth/OC Events. 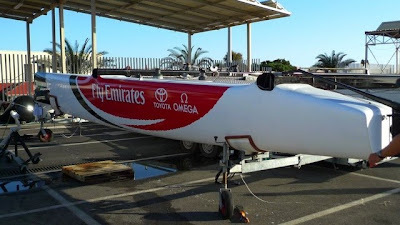 Six regular circuit teams, plus two new entries: Rumbo Almería, skippered by Guillermo Altadill, and Emirates Team New Zealand, headed up by Dean Barker. It’s all to play over the next five days with a mixed weather forecast that will deliver both light airs and potentially stronger winds over the weekend, the podium is wide open as is the promise of many closely fought races. Extreme 40s in Almeria. Image copyright Paul Wyeth/OC Events. 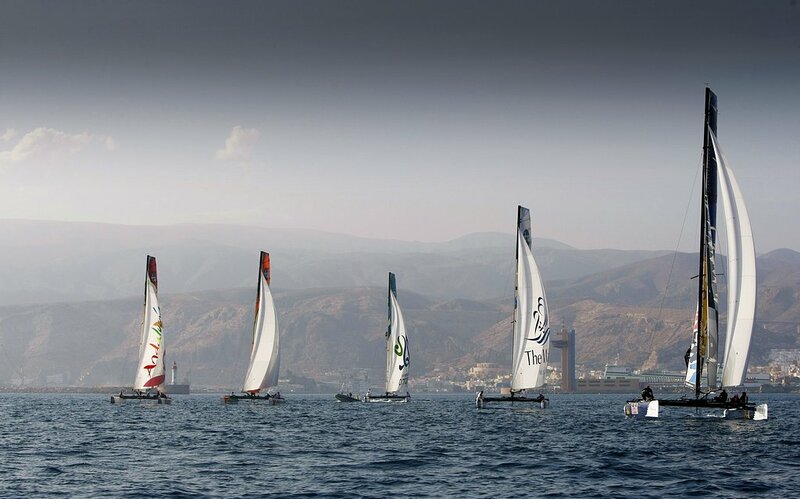 Mike Golding’s Ecover Sailing Team also lead Oman Sail Masirah by a single point and the final podium positions are really open for the taking. Further down the leaderboard, the battles continue and Franck Cammas’ Groupama 40 leads Red Bull Extreme Sailing by a point. 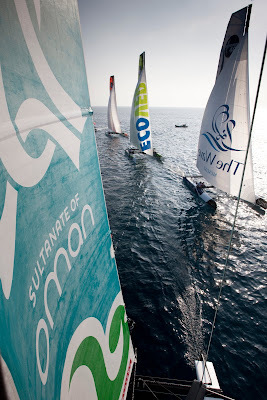 The fleet, as seen from part-way up the mast on Oman Sail's Masirah. Image copyright Mark Lloyd/Lloyd Images/OC Events. But if the crews are determined to earn as many points as possible to try and make their way up the leaderboard, they have each been supporting a charity throughout the season, using the circuit’s exposure to raise awareness for good causes. The four-day final event falls over the Spanish Bank Holiday and thousands of public are expected to descend on the Race Village, having experienced the unique ‘stadium’ style of racing last year. Stephen Ainsworth’s RP63 Loki, takes the trifecta of race record, line honours and overall win in the Flinders Islet race and leads the Blue Water Pointscore series. Image copyright Andrea Francolini. Stephen Ainsworth and his yacht Loki have added to their growing record collection, breaking the Cruising Yacht Club of Australia’s 92 nautical mile Flinders Islet Race record after taking line honours in the early hours of this morning at 03.48.44am, completing the race in the time of 7 hours 48mins 44secs to also win the race overall – making it his second race trifecta in 19 months. The Reichel/Pugh 63, representing the CYCA, shaved 41mins 45secs from the record set by Matt Allen’s Jones 70 Ichi Ban, of 8 hours 30mins 29secs, in 2006 and today’s overall win was by nearly one hour over Syd Fischer’s Ragamuffin and a further 20 plus minutes to third placed Victoire, a Beneteau First 45 owned by Darryl Hodgkinson and skippered by Travis Tubman. Remarkably, Ainsworth, who wins the 50th running of the Ron Robertson Memorial Trophy for his overall win, now hold records for three of the BWPS’ seven races with his current Loki. He adds the Flinders Islet record to the 2009 Cabbage Tree Island and Audi Sydney Offshore Newcastle Yacht race records, claiming the treble in the latter race. Having missed out on winning the BWPS last season by four points, after finishing fourth in arguably the closest finish in the history of the event, Ainsworth made it clear he would be back to complete unfinished business. Loki has proved to be the best gift Ainsworth has ever given himself. Apart from his race records, the Sydney businessman has scored numerous line and overall wins, including winning the opening two races of the current BWPS. Loki is also the 2010 Audi IRC Australian Championship winner, scoring victories in each of the four events attached to the series which finished in late August. This morning, Ainsworth told of a beautiful night’s nearly all-reaching race: “One of the crew said it would be a two-tack and one-gybe sail, and he was right. We reached nearly all the way there and back in a consistent breeze, although it was a bit soft going around the island. We were fairly sure we had won the race when we came around the island and saw where everyone else was. We broke the record – it doesn’t get any better than that,” stated Ainsworth, who was sleeping off the after effects as the rest of the fleet trickled home. “We shot off like the Bondi Tram early on and spotted a whale playing off Bondi – it was only 30-50 metres from us and you could see it clearly – that was special,” said Ainsworth. 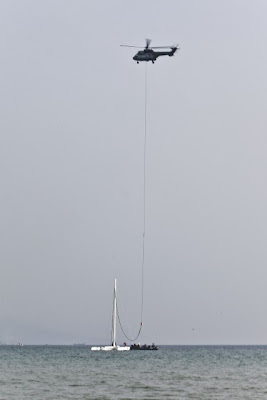 “It was mostly an east-sou-easterly 8-12 knot breeze that peaked at about 16 knots in the gusts. It was champagne sailing. The wind moved around a bit; we got some big (20 degree) shifts as the breeze went more east then back again,” said Ainsworth, who admitted it was all about having the right conditions. 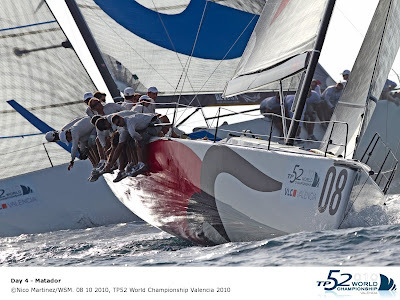 Next to finish was Syd Fischer’s TP52 Ragamuffin (at 05.26.11) followed shortly after by Colin Woods’ Cookson 50 Pretty Fly III and Graeme Wood’s TP52 Wot Yot, entered under the name of Karen Hawkett and raced for the first time by David Pescud’s Sailors With Disabilities crew. 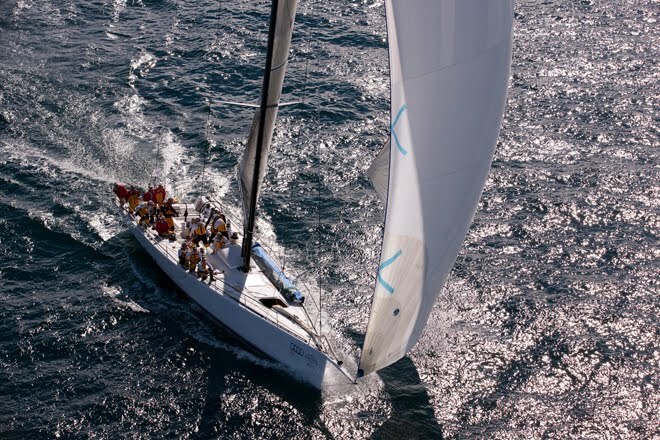 “I expect the last of the fleet in by around 11.30am – it’s been an uneventful and quick race so far,” the CYCA’s principal race officer Denis Thompson said early this morning. He was right on the mark, with Jonathan Stone’s Illusion finishing just after 11.30pm. Before the 29-boat fleet set out in a 10-12 east-sou-easterly breeze at 8.00pm last evening on Sydney Harbour, Andrew Short and Sally Gordon were remembered when Denis Thompson announced a moment of reflection, marking the first anniversary of the pair’s tragic loss in this race last year. With three wins from three races, Ainsworth has a convincing lead in the Blue Water Pointscore, which has four races remaining, including the Rolex Sydney Hobart, which cannot be used as the series discard. Ragamuffin is second on 13 points and Roger Hickman’s Farr 43 Wild Rose is third on 20 points following a fifth place in today’s race. Loki also has a sizeable lead in the Tasman Pointscore (PHS category) from Wild Rose and Greg Zyner’s Copernicus, while Ragamuffin leads Colin and Gladys Woods’ Pretty Fly III and Wild Rose in the Cape Byron Pointscore (ORCi category). Gerard Marín (ESP) and Ludovic Aglaor (FRA) will be competing on board Fòrum Marítim Català (FMC) in the upcoming edition of the Barcelona World Race, the double-handed, round the world race which sets off from the Catalan capital on 31st December this year. Their entry will also be a platform for raising the profile of the activities of the Fòrum Marítim Català and the Fundació Navegació Oceànica Barcelona which foster innovation in the maritime and marine sector. Both organisations have been developing extensive R+D programmes which they will seek to publicise and validate during this second edition of the round the world race such as the WIN-D project, which involves technological innovation applied to high tech ocean racing sails. This initiative has been made possible thanks to the support provided by the Santa Lucía insurance company, official partner of the race, and by the official suppliers of the Barcelona Offshore Sailing Base: Renault, International Paints Akzo-Nobel, Marina Port Vell, Marina ’92, GAES, Quantum, Clínicas Vital Dent and Centro Médico Teknon. 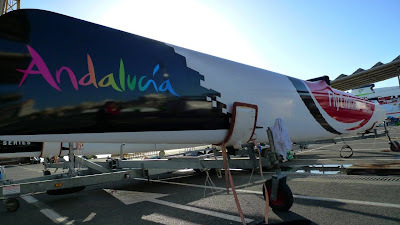 Gerard Marín and Ludovic Aglaor will be racing on the former Kingfisher, the IMOCA Open 60 that Dame Ellen MacArthur raced in the Vendée Globe. With the name Educación Sin Fronteras, Albert Bargués and Servane Escoffier later took the yacht to the first edition of the Barcelona World Race. In early 2010 the yacht underwent a complete refit, incorporating the latest IMOCA technological developments into her features. 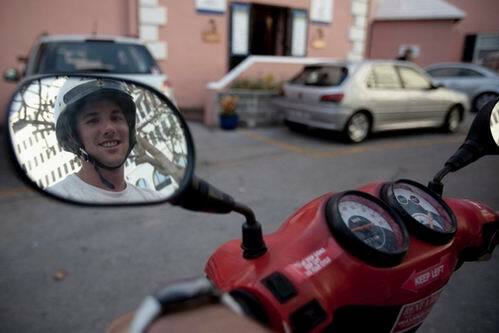 For young Spaniard Gerard Marin (L’Escala, 1982), the FMC project is a great step forward. 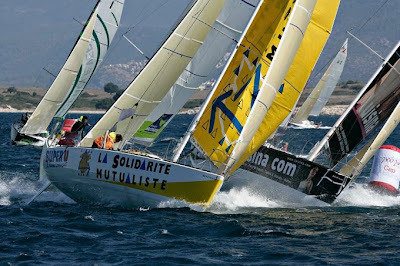 His move into the IMOCA Open 60 Class is a step up from his great experience and progress in the Mini 6.50 Class, where he raced in 2006, 2007 and 2009 (Mini GAES Solidaria), having previously built up an important list of international achievements in the Europe Class. 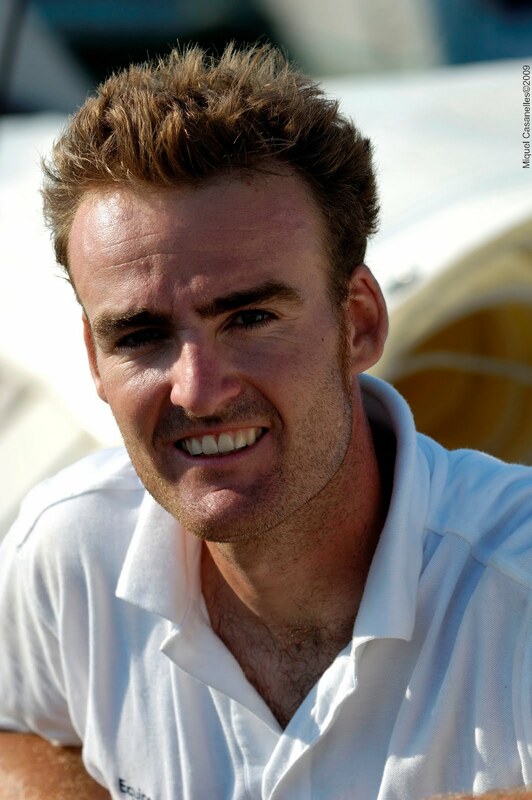 Sailing alongside one of Spain's great young hopes will be seasoned French yachtsman Ludovic Aglaor (La Flèche, 1966) 2005 winner of the Jules Verne Trophy onboard Bruno Peyron's Orange 2 and winner of the Tea Route 2008 onboard the maxi catamaran Gitana 13 skippered by Lionel Lemonchois. 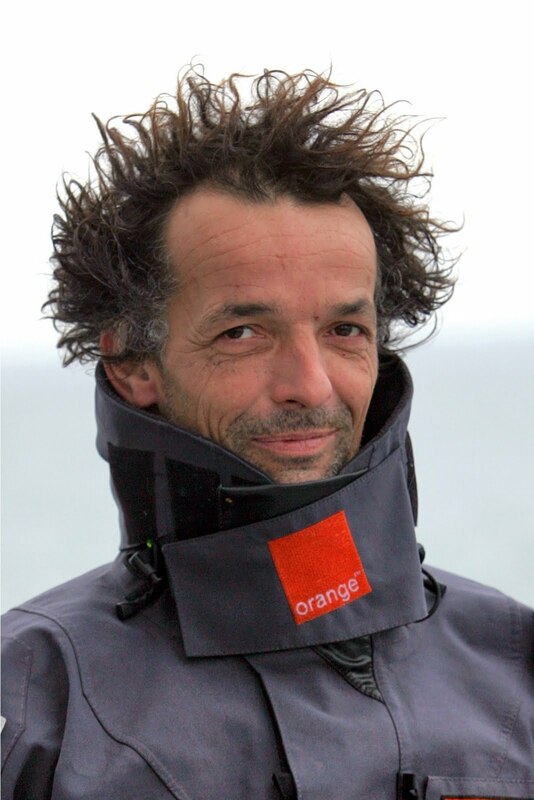 Aglaor's extensive career in offshore sailing includes 19 transatlantic crossings, however, his speciality is preparing yachts and he's been called upon for many different campaigns by Alain Gautier, Philippe Poupon and Dominique Vittet, among others. 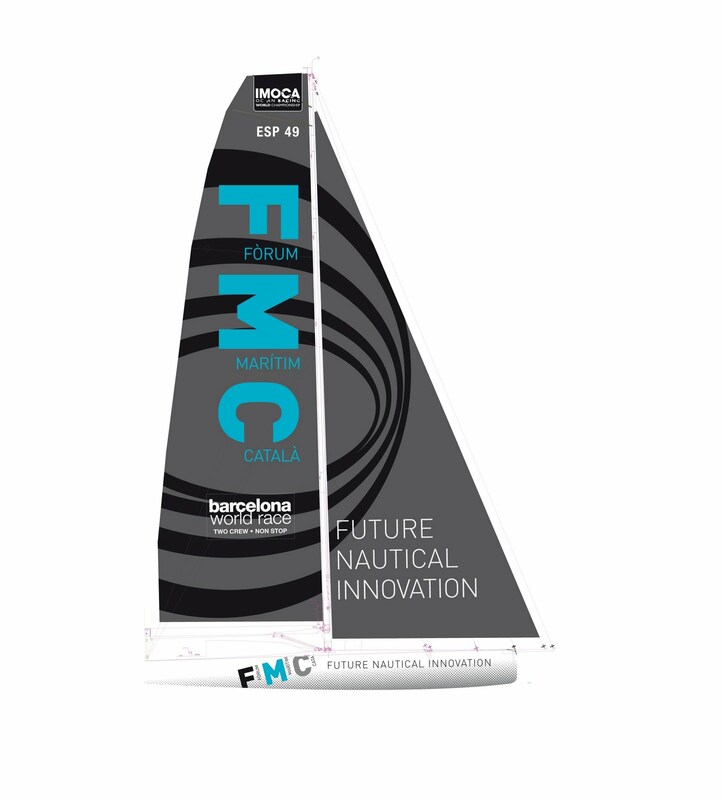 Pere Alcober, Sports Councillor for Barcelona City Council and President of the FNOB reflected on the significance of this new project: “FMC will be a banner for all of the innovation projects supported by the Fundaciò and the Fòrum Marítim Català during the upcoming edition of the Barcelona World Race. We are very happy with this collaboration between public bodies and private companies, which allows this great sporting and technological challenge to come to life”. Toni Tió, President of the Forum Maritim Català, went on to underline that: “The FMC team will allow the profile of the Fòrum Marítim Català and its objectives to be raised and will strengthen the collaboration between the FNOB and the R+D projects that form part of our programme across the maritime sector”. Andor Serra, Director of the Fundació Navegació Oceánica Barcelona, commented on the important sporting aspect of the project: “It is very important for the FNOB and the Barcelona World Race to welcome young crews, taking their first steps into a regatta of this scale. The FMC team allows us to broaden the sporting horizons of Spanish offshore sailing and to make room for new talent”. 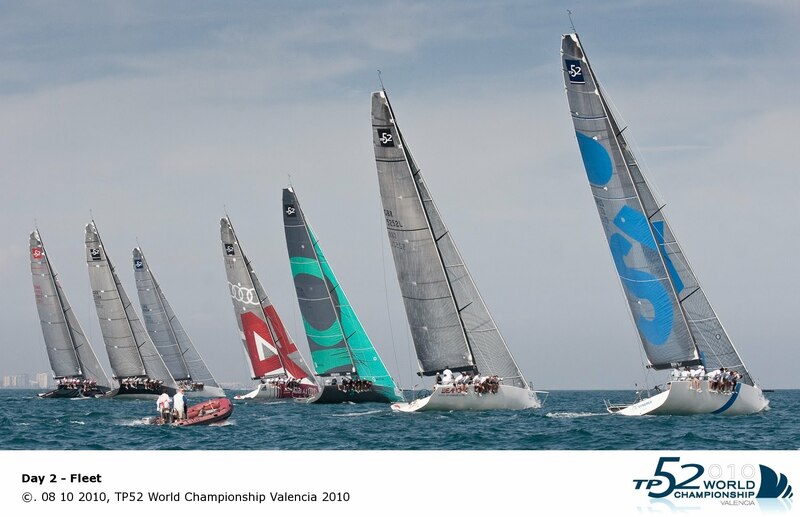 With this announcement from FMC there are now 12 teams on the upcoming Barcelona World Race entry list. There will soon be presentations from three of the other officially registered teams. Audi A1 powered by ALL4ONE finished 4th in the first race. After a very good start, the team didn't really feel well in terms of boat speed in the first beat, but rounded the two first marks in 3rd position. Then they chose to play on the left side of the race course in the second upwind leg, but it was a bit more favourable on the right. So Matador came back on the French-German team, and took the 3rd place over. Audi A1 powered by ALL4ONE rounded 4th at the mark as a consequence, and was forced to jibe several times in the last downwind leg to finish the race. On the second race, it is another very good start for Audi A1 powered by ALL4ONE, but the shifty conditions and light winds don't make the team's work easy at all. Jochen Schümann and his crew finished 3rd on this race. Philippe Mourniac, Navigator: " It's mainly the conditions that made our day quite difficult in the end, that is to say the wind's strength and direction in particular, as these are the most important parameters. Sometimes the situation can even be totally different 100m away from where we are on the water. Then we were also involved in close contact situations too much with two or three boats each time, which forced us to jibe or to tack more than the others, and that make things more difficult." Luke Molloy, Mainsail Trimmer: " today we had the light sea breeze that we expected. First race was a struggle as we got out of the line well, and sailed the first beat quite well, but dropped back and were under pressure from there. We finished 4th. That's not too bad as the race was really close. In the second race we had another good start, played the right a little bit that didn't pay off first, but then we had a good shift on the first downwind and battled with Synergy and Matador for 2nd and 3rd places. It was a tricky day in the end, which was not following any normal trend." Another tough day for Artemis with an 8, 6. We are still in 4th place overall, but we are closer to 5th than third. The wind came up late today and we got racing at 1500 in 8 knots and fairly smooth seas. We just didn't have a stellar day in any area, starts, tactics nor speed. So, we paid the price. Quantum sailed well to get a 2, 1 and Matador almost as well with a 3, 2. Quantum leads Matador by a couple of points for the world title. Synergy is in 3rd place and Cristabella is 5th. So, we have our work cut out for us to get a podium finish tomorrow. The forecast isn't promising. 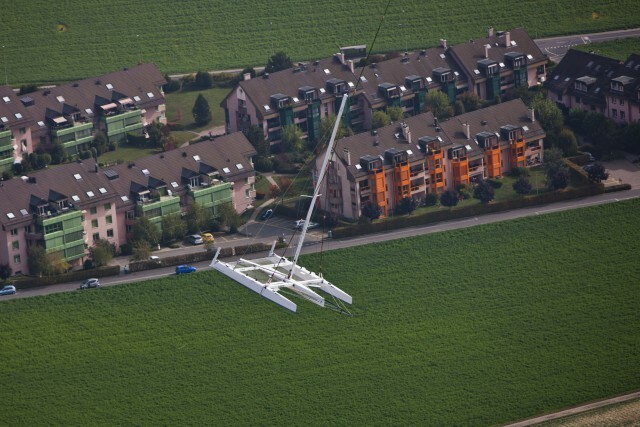 It could be that there won't be enough wind to race but at least it will be raining. 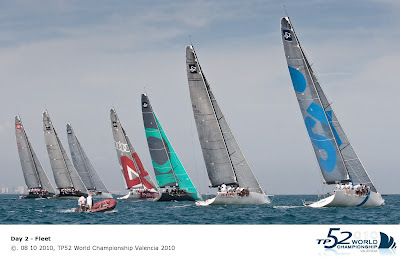 Quite a few of us are flying to Madrid tomorrow night and then onto Lanzarote Sunday morning for the RC44 World Championship that starts there Monday. It is going to be a busy weekend! 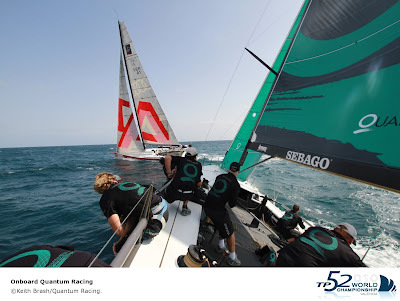 Quantum Racing took two small, but very positive steps closer to a second TP52 world championship title today off Valencia as their second and first place finishes in light, hazy sea breeze conditions allowed them to increase their lead over defending title holders Matador to three points. 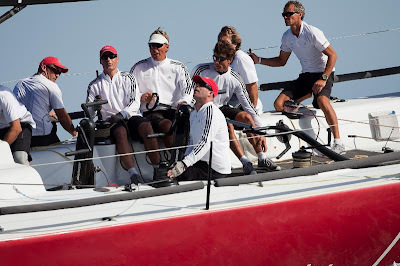 The American team, who won their 2008 world title in breezy Lanzarote and tied on overall points with winners Matador in Palma last Autumn, just got the better of their rivals to win the key second race today. After a nail-biting opening beat Matador had only just lead around the windward mark but Quantum split away on the run and were able to just squeeze in front of Matador when they converged on the approach to the first leeward gate. Their 2,1 for the day against Matador’s 3,2 sees Quantum Racing go into the regatta’s final day with a small cushion, their reward for now only once finished outside the top three over the eight races to date. In third place overall remain Russia’s Synergy team, who finished fourth last year, losing their claim to Artemis’ third on countback. This time the Russian crew, with Kiwi Rod Dawson doing sterling work as tactician, lead Artemis into the final day by a margin of just one point. But their day’s work today was marred by disqualification from Race 7 after a protest against them by Audi A1 powered by All4ONE (FRA/GER). Noticeably today the pairs of duelling protagonists often stayed within the same stretch of water as the regatta nears its conclusion, with more protective rather than attacking tactics evident. It was John Cook’s Cristabella (GBR) which triumphed in the first race, the fifth boat to win a race at these 2010 World Championship. They started with speed off the pin end of the line and were able to gain leverage on the fleet out on the left side of the course. Quantum Racing finished second with Matador containing Audi A1 powered by All4ONE for third. In 6-8 kts of sea later afternoon sea breeze Quantum Racing started mid-line and Matador at the committee boat end of the start line the duo tussled for the lead on the approach to the windward mark. Matador got round just a boat length ahead. They went to the left down the run and made an initial gain but Quantum Racing found slightly more pressure and a small favourable shift in the dying breeze went slightly right and only just crossed ahead of their rivals. As they rounded the leeward gate, Quantum Racing rounded the right hand gate mark and gained a small jump as the new breeze built more from the right, while Matador suffered a little. 'Its going to go down to the last race I think. Matador sailed a very good day today and we sailed slightly better, we got some good starts we sailed the boat fast and I think the key was in the second race today getting past matador on the first downwind and that sort of made a little difference to the day. “But we were really pleased we got two races today, Maria and the team did great. Great team effort today, it was good to bounce back after a disappointing race yesterday. We are really pleased”. “At best we were even. (on the first beat) In terms of bearing there was not much in it. It was one of those where we could have closed them down, but in the end they got their tack in with a boat length to spare. They forced the decision on whether we go behind them and we then got them down the run. “It was surprinsingly good for us. We got a great start and we didn't go for very far and then the breeze went left and we tacked and we had more pressure than the fleet, so we went back across and were comfortable. So it was quite exciting. We had a nice race, sailed on our own, so we are happy about that. Normally our races are really close and it was nice to just sail round five or six lengths in front. We were relaxed. I've sailed with Nacho Braquehais on this TP52 when it was Desafío and it's really helpful to have a local strategist, someone I know as well. So there's a lot of talk about what's going to happen next so he's helping a lot and making our lives much easier”. “You have now got a few boats at the top of the fleet who are all very close, so everyone is tacking on each other, and trying to defend not only their place in the race but their position in the overall regatta so you can actually see people going to the side of the course more with their opposition, than where they think the wind is going to come from. In the end I think the top boats have come to the top and obviously Quantum and Matador are very fast boats in the light air and those two showed their ability. "But we are pretty happy with were we are. The light air we had today, 7 to 9 knots is not quite our optimum conditions for the boat so to come away from a day like that with two fours we are really happy”. Francesco Bruni (ITA), tactician Matador (ITA):“It was a good day today cause we made just an average start in the first race but managed to pass several boats thus finishing third, just one point behind Quantum, so we are really happy with that. In the next race Alberto did a great start, it was really the best of the championship up to now, the boat was going fast and we were first at the top mark and then we went for a jibe set but on the run there was a right shift of around 20º and Quantum passed us, it was a pitty, but it was a decision we made with the head, ans sometimes your are right and some you are not, and you have to live with that. Because the distance to Quantum was so small, we had to make a decision, we just couldn't keep chasing him”. The baby brother of the original l’Hydroptère, called l’Hydroptère.ch, entered the water at Saint-Sulpice, near Lausanne, on Lake Geneva today for the first time. L’Hydroptère.ch is the test platform for the eventual build of a much larger, ocean-going, Hydroptère. l’Hydroptère.ch Image copyright Guilain Grenier. WOW Cap Istanbul: Hard Work on Leg 4! Sur les pontons de Didim, les expressions sont plus tendues qu'à l'habitude. Ils ne descendent pas au fond de la mine, mais ils savent que les premières heures de cette étape n'auront rien d'une partie de plaisir. Et le vent du nord qui monte en puissance, siffle dans les haubans et fait claquer les drisses n'y est pas étranger. Alors chacun se retranche dans sa bulle, fait une dernière analyse des fichiers météo, procède aux ultimes vérifications, histoire de se rassurer, de se dire que rien n'a été laissé au hasard. Et puis, il y a ceux qui affichent des façades de circonstance, qui espèrent que cette étape va enfin redistribuer les cartes. D'autres préfèrent jouer la discrétion ; ils savent qu'ils sont particulièrement à l'aise dans la brise et se disent qu'ils ont là une belle carte à jouer. Mais la plupart fait, contre mauvaise fortune, bon cour. Le mauvais temps au près n'est pas leur tasse de thé préférée, mais tout le monde sera logé à la même enseigne. 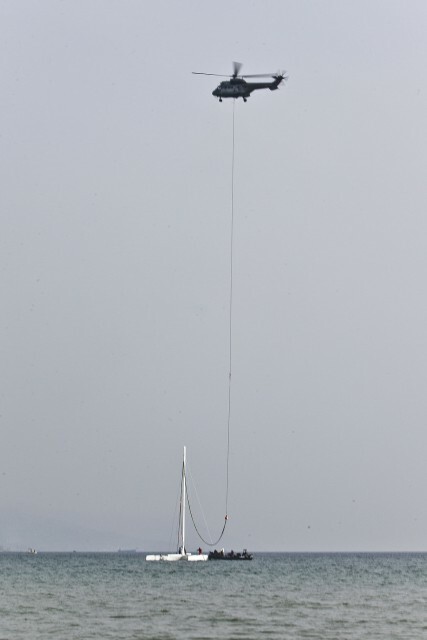 Et du côté de la direction de course, on avoue préférer savoir la flotte en train de faire profil bas et lutter contre des vents forts, plutôt que de voir les voiliers débouler par quarante nouds de vent aux allures portantes, autrement plus dangereuses pour les hommes. Francisco Lobato (Roff Tempo Team) est un garçon d'une politesse exquise, poussant l'élégance à offrir le bouquet de fleurs qu'il a reçu pour sa deuxième place à une des femmes de l'équipe d'organisation. Il connait sur le bout des doigts les valeurs du fair-play et, en vertu de ces principes, sait reconnaître sans ambage la valeur de la victoire sur le fil d'un François Gabart (Skipper Macif 2010). Mais cela ne l'empêche pas d'être un véritable combattant : malgré les vingt-cinq à trente nouds de vent sur la ligne de départ, il n'hésite pas à venir chercher le côté favorable de la ligne, rasant les moustaches de la bouée de départ. Ce faisant, il prive Gildas Morvan (Cercle Vert) de toute velléité de départ bâbord, malgré des trajectoires dangereusement convergentes. Contrôlant toute la flotte, il s'offre ensuite le culot de venir bâbord amure sur la bouée de dégagement et de virer au nez et à la barbe d'une avant-garde compacte menée par Damien Guillou (La Solidarité Mutualiste), Mika Mergui (TPM Hyères) et Anthony Marchand (Espoir Région Bretagne). Comme quoi, on peut avoir la meilleure des éducations et savoir se faire respecter , si nécessaire. Le circuit Figaro Bénéteau n'a pas fini d'entendre la petite musique du navigateur portugais. D'autres n'ont pas eu la réussite de Francisco. Jean-Pierre Nicol (Bernard Controls) se voyait contraint d'abandonner avant même le début de la procédure, suite à la rupture d'un de ses haubans intermédiaires. 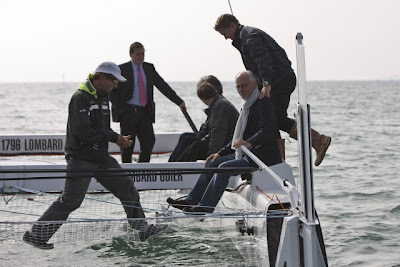 Jean-Pierre va tout faire pour réparer et convoyer dans les plus brefs délais son voilier pour Bozcaada, de manière à prendre le départ de la dernière étape. Eric Péron (Skipper Macif 2009), malgré un bon départ, voyait ses efforts mis en pièces suite au déralinguage de son solent. 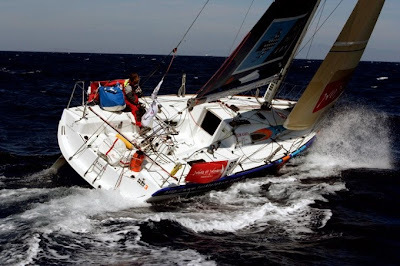 Par trois fois, Eric a tenté de renvoyer sa voile d'avant et par trois fois, elle est sortie de son guide. Relégué en queue de flotte, le navigateur bigouden a dû bricoler une sorte d'anneau pour maintenir la tête de sa voile contre l'étai. Résultat de l'opération, de précieux milles de perdus et une bonne suée : pas les conditions idéales pour commencer une étape que tout le monde pressent comme particulièrement physique. Mais comme le notait avec philosophie Eric Péron, la route est encore longue jusqu'à Bozcaada et bien des retournements de situation peuvent survenir. 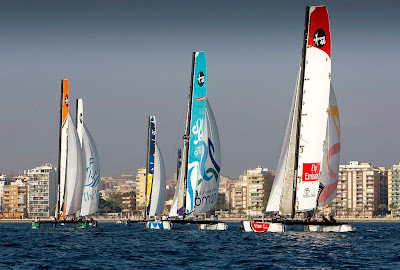 Tomorrow sees the start of the fifth and final Grand Prix of the Extreme Sailing Series. The 2010 championship is drawing to a close and the new winner will be revealed on Tuesday 12th October after four days of competition disputed on the race zone of Almeria, at the southern tip of Spain in Andalusia. With four boats still in contention for the outright title, proceedings will doubtless be lively with some full-on nautical battles. For Yann Guichard’s men, lying in ambush on the second step of the provisional podium and winners of two of the four events already contested, naturally the objective remains outright victory. However, more important to the crew of Edmond de Rothschild Group than the result, is the way in which they sail. 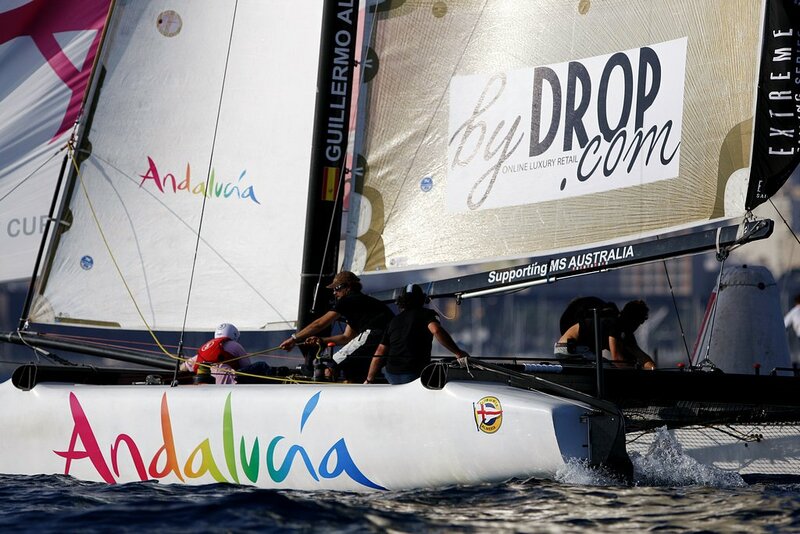 The Andalusian city of Almeria is playing host to the fleet of Extreme 40s for the second year running. Furthermore, for the 2010 season final, the organisers have concocted a full race programme for the eight competing teams. The competition days will begin shortly after 1400 hours with so-called ‘long’ races, contested just outside the harbour walls. Following on from these, midway through the afternoon, the fleet of one design catamarans will compete in the event’s more familiar short race formats, right next to the quayside in Almeria to put on a show for the big Spanish crowds expected: “Unlike last year, where all the races were run within the harbour walls, we have some races scheduled to take place outside involving some slightly longer courses. The variety and the switch in race format is a positive thing. We’ll have to be versatile to hang onto our position at top of the table, which isn’t something I mind!” explains Yann Guichard. 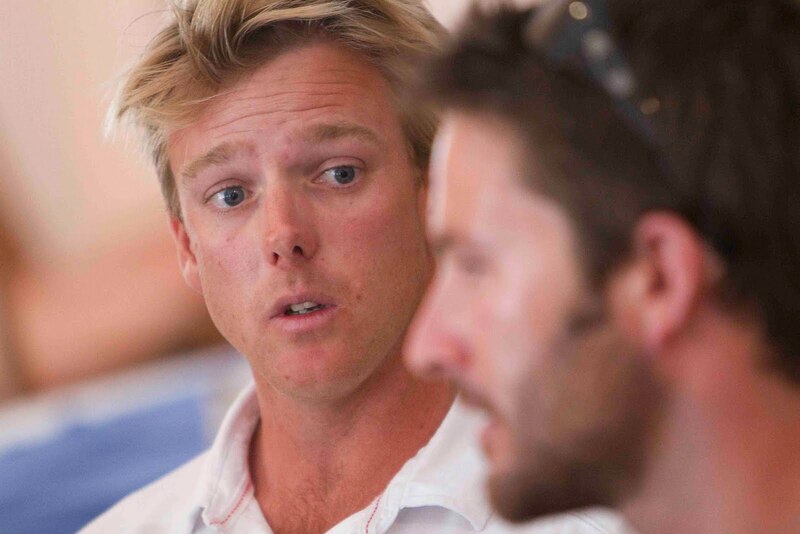 Since Trapani, the skipper of Edmond de Rothschild Group has spared no effort and has had to adapt to a busy schedule. Indeed for several months now, Yann Guichard has been juggling two objectives: that of winning the crewed Extreme Sailing Series and that of earning another victory for Gitana Team in the famous solo transatlantic race between Saint Malo and Pointe-à-Pitre, the start of which is looming ever closer. 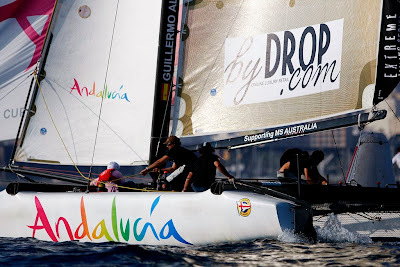 A Spanish Extreme 40 called Rumbo Almeria, co-skippered by Mitch Booth and Guillermo Altadill, will join the regular teams, along with a one design from New Zealand (Emirates Team New Zealand) helmed by Dean Barker. The arrival of these two crews brings the number of teams competing in the Grand Prix of Almeria to eight. Normandy Sailing Week 2011 is Open! 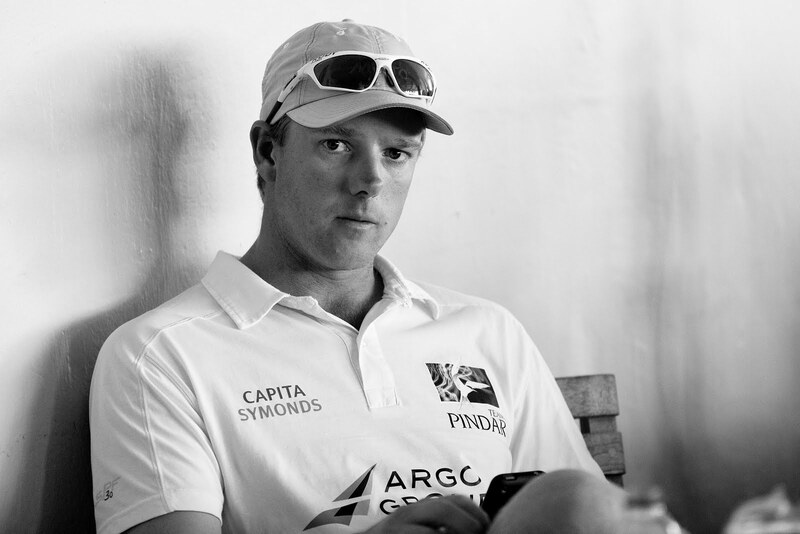 WMRT: Is Richard's Loss Minoprio's Gain?